BEIJING- A Chinese manned spacecraft blasted off with three astronauts on board on Tuesday on a 15-day mission to an experimental space lab in the latest step towards the development of a space station. The Shenzhou 10 spacecraft was launched from a remote site in the Gobi desert in China’s far west at 5:38 p.m. (0938 GMT) under warm, clear blue skies, in images carried live on state television. China successfully carried out its first manned docking exercise with Tiangong 1 last June, a milestone in an effort to acquire the technological and logistical skills to run a full space station that can house people for long periods. President Xi Jinping oversaw Tuesday’s launch personally, addressing the astronauts before they blasted off to wish them success, saying he was “enormously happy” to be there. This mission will be the longest time Chinese astronauts have spent in space, and marks the second mission for lead astronaut Nie Haisheng. 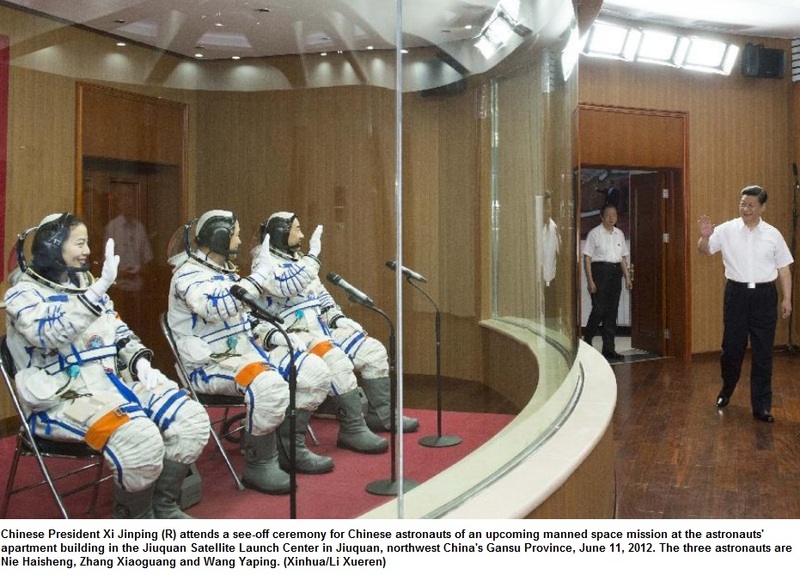 It is China’s fifth manned space mission since 2003, and was accompanied by the usual outpouring of national pride and Communist Party propaganda, including children dressed as happy ethnic minorities waving off the three at the space centre. However, some wondered why China was spending so much money exploring space when it was still a developing country with a plethora of more pressing issues, from food safety and pollution to the prevalence of workplace fire disasters. “Why don’t they spend this money solving China’s real problems instead of wasting it like this?” wrote one user on China’s popular Twitter-like service, Sina Weibo. 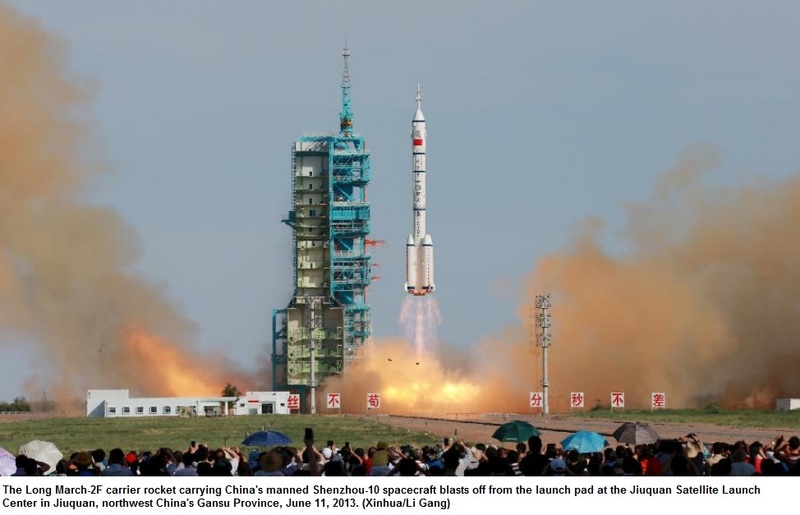 China’s space program has come a long way since late leader Mao Zedong, founder of Communist China in 1949, lamented that the country could not even launch a potato into space. But China is still far from catching up with the established space superpowers, the United States and Russia. Rendezvous and docking techniques such as those which China is only testing now were mastered by the United States and the former Soviet Union decades ago, and the 10.5 meter-long Tiangong 1 is a trial module, not a fully fledged space station. Still, the Shenzhou 10 mission will be the latest show of China’s growing prowess in space and comes while budget restraints and shifting priorities have held back U.S. manned space launches. China also plans an unmanned moon landing and deployment of a moon rover. Scientists have raised the possibility of sending a man to the moon, but not before 2020. While Beijing insists its space program is for peaceful purposes, a Pentagon report last month highlighted China’s increasing space capabilities and said Beijing was pursuing a variety of activities aimed at preventing its adversaries from using space-based assets during a crisis. QINGDAO- China’s first aircraft carrier, the Liaoning, has left its homeport of Qingdao in east China’s Shandong Province to conduct scientific experiments and sea training, naval authorities said Tuesday. This was the first time for the carrier to leave its homeport to conduct training voyage since it anchored there in February, according to the People’s Liberation Army (PLA) Navy. The Liaoning and its crew members had conducted a series of scheduled tests and training drills in the homeport during the period. Currently, China operates one aircraft carrier, the Liaoning, which was refitted based on an unfinished Russian-made carrier and delivered to the Navy on Sept. 25, 2012.